Give something good. Do something great. Donating to Goodwill is fast, easy, and convenient. 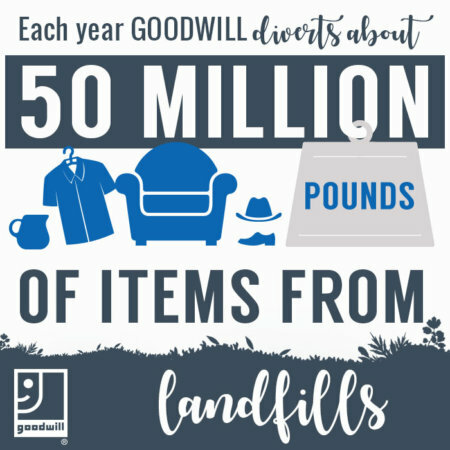 Even better, when you donate to Goodwill, your donation helps someone find a job, strengthens your community, and preserves the planet. We accept donations at each of our stores across Kentucky, and your donations are tax deductible. If you have an unusually large quantity of items to donate, or you work for a business that is offloading furniture or other large items, please contact our Director of Transportation & Logistics at 502-648-3974. If you itemize deductions on your federal tax return, you are entitled to claim a charitable deduction for your donations to Goodwill. Financial donation: If you donate financially to Goodwill, keep a copy of the acknowledgment letter from Goodwill for tax purposes. Goods donation: Market values are based on items in good condition and may vary from one region to another. Consult a local tax advisor who is familiar with market values in your region, and keep the donation receipt(s) that is available at the time of your donation. As a convenience to our donors, we have identified the following tax guides available from the Internal Revenue Service and several websites that may assist you in valuing your donations for tax purposes. Goodwill endorses neither accuracy nor appropriateness of the valuations listed. Please consult with your tax advisor for actual deductibility of your donation. Determining the Fair Value of Property: Defines “fair market value” and helps donors and appraisers determine the value of property given to qualified organizations (Publication 561). Noncash Charitable Contributions: Applies to deduction claims totaling more than $500 for all contributed items (Form 8283). Charitable Contributions: Explains which organizations are qualified to receive deductible charitable contributions, the types of contributions you can deduct, how much you can deduct, what records to keep, and how to report charitable contributions (Publication 526). Donate a vehicle to help a local family. Help put Kentuckians behind the wheel so they can get to work. Interested? Please see the volunteer application form, or contact Martha Stephenson, Director of Development, at martha.stephenson@goodwillky.org or 502-272-1702. To complete court-ordered community service requirements, please call or visit your local Goodwill store and speak with the manager on duty. You might be thinking, “Why does Goodwill need my money? Don’t they sell things in their stores?” While selling donated items is a primary way Goodwill funds mission-related services, financial gifts are equally important. Your gift is tax-deductible, and we appreciate every penny.